A site that helped Berkeleyside, an independent journalism website, raise $1,000,000 of funding with its innovated use of a Direct Public Offering. Like all independent news publications, Berkeleyside had to face its funding challenges head-on. Users are generally not fond of paywalls, and there is a limit to how much advertising users are willing to wade through while reading an article. This website was designed to allow Berkeleyside’s readers to apply invest directly in their favorite publication, sharing in any potential profits down the road and ensuring the publication’s viability for the foreseeable future. Users were able to apply via an online form that we developed, as well as sign the required documents with their finger on their phone or tablet, or with a mouse on desktop. 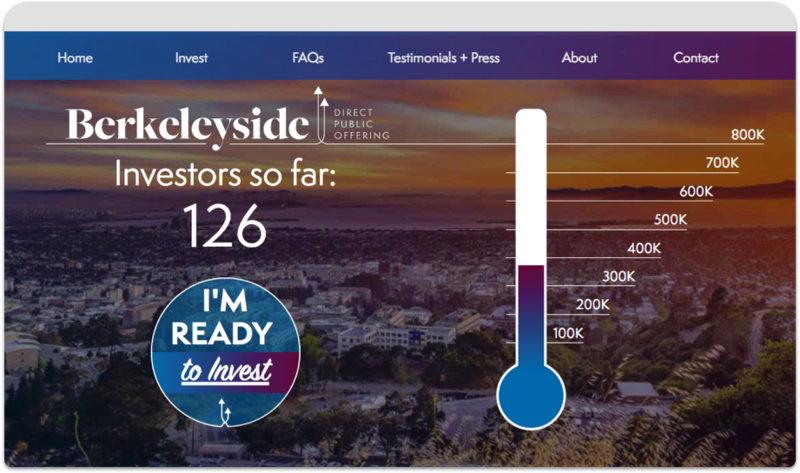 Visit invest.berkeleyside.com to see it in action. 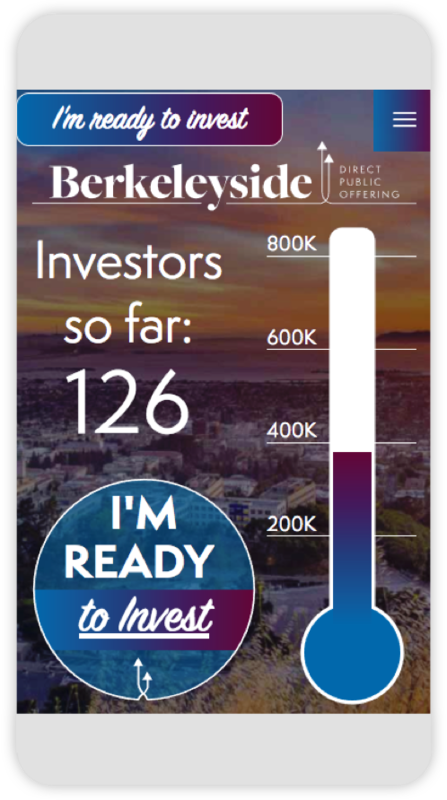 This thermometer was updatable by Berkeleyside’s staff as new investments came in. This verification and signing process would otherwise have had to have been completed in a series of emeails, in person, or even by postal mail. In order to prevent overwhelming potential investors with a wall of text, we chose to offer succinct descriptions of the main points of the offer. We wanted users to feel as if they were having a conversation with a real person, getting answers to their questions and concerns. The text is still present in the site’s HTML, so users who are using screen readers can still read the content, and search engines can parse both the question and the answers presented here.